Earlier today we were having a bit of an Autumn tidy in our Park Slope apartment - Taking out recycling, vacuuming rugs, putting away the clean laundry - then there was a face off with the stove top. I put on my silly purple rubber gloves and had a moment of realization - this was the kind "regular life" moment to take note of and incorporate my Massage Therapy Body Mechanics! Proper Body Mechanics make all the the difference in the longevity of a massage therapy career. Taking care of your body as a LMT isn't limited to just when doing massage. The truth is - I was frictioning my stove - is there a better time to enforce the habit of using Good Body Mechanics? 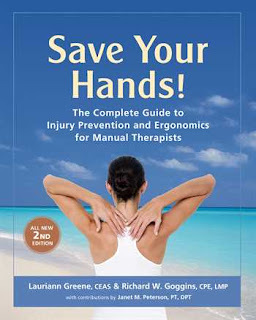 Save Your Hands defines Good Body Mechanics in three main concepts: Breathing, Posture and Movement. Breathing: It may seem unnatural, but it's surprisingly common for people to hold their breath when concentrating - especially if holding a physical position that may seems like work at the beginning. Proper upper body mechanics let you breathe easy. Long spine, open chest, shoulders relaxed and awareness of breath during your work is key. If you can keep your energy up - yet calm, your client will hopeful find a cleansing breath along with you. Posture and Movement: The ideals of centering, balance, strength and flexibility are built into Good Body Mechanics. Most of these body postures are based on Ancient Martial Arts. The concept is to sink your weight into the ground, allowing the Earth to hold you up. Then you have the energy and focus to be in control of your pressure on the client. This kind of foundation can be achieved in a few stances, depending on what massage technique you are using at the time. When facing the client directly and working specifically on a small area (like frictioning or working trigger points) aim to always have alignment of the hips, knees, and ankles. If you are using strokes with more movement (effluerage, petrissage, ROM) a lunge gives a steady but flexible base to move easily and keep your structure intact. Having a long, neutral spine in all positions will lessen stress and possible injury for the therapist as well. The idea of neutral is just as important when thinking about the wrists. The wrist is a very flexible joint - but it is very easy to injure. Trying to keep your wrist in a neutral position will involve incorporating the rest of your body to do so. You might have to sink lower in your lunge to get your hands more level. At times you may have to opt to use your forearm, soft fists, pulling or tapotement to get your client's needs met without putting yourself at risk! This is just a basic introduction to Good Body Mechanics - some tips to get you to breath easy, be balanced, and have awarenss. Help yourself to a long Massage Therapy career taking care of others by taking care of yourself! I love that book. I've read it cover to cover.